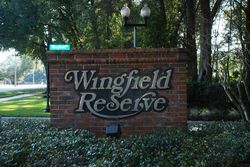 Wingfield Reserve is an upscale community located off Markham Woods Road in the desirable Markham Woods corridor. There are 183 large well-appointed homes on lots of one acre or more. The community is well landscaped and contains many large mature trees. In addition there are six ponds – two of which contain lighted fountains – a conservation area and community tennis courts. There are two entrances off Markham Woods Road for easy access to and from Markham Woods Road. Restaurants, shopping and everyday conveniences are closeby and easy to get to and there are two I-4 interchanges only minutes away for carefree commuting.